Chapter 1 is a personal remembrance of the author being captivated by ink, a brief summary of several aspects of its history, and a number of his thoughts, descriptions of his experiments in ink making from a number of alternate sources of gallo-tannin besides oak gals. 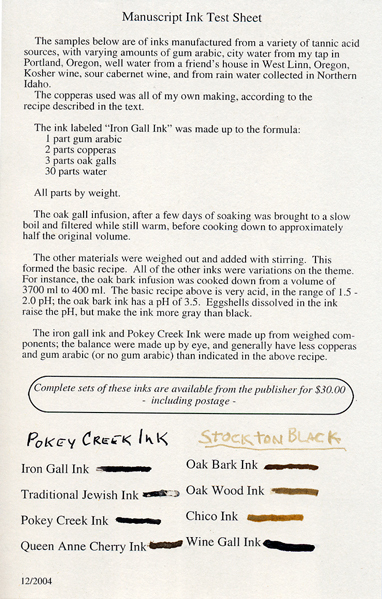 Did I mention that, tucked between the cover and the frontispiece is a loose page that includes a basic recipe, and samples of writing from a few of his experiments; these include a traditional iron gall ink, a traditional Jewish Ink, a wine gall ink, and several experimental inks such as Pokey Creek Ink, Queen Anne Cherry Ink, Oak Bark Ink, Oak Wood Ink, and Chico Ink.The colors range from brown to black, and the Traditional Jewish Ink and the Wine Gall Ink are both densely black, heavy, shiny inks. He tells you how to make your own copperas, too, and includes a number of tips to keep you safe (you boil iron in concentrated sulfuric acid). Chapter two is a Booke of Secrets., basically a collection of recipes for a many different inks. The original is in the Yale Center for British Art, and the English version is a translation of a Dutch translation from a German original, first published in Nuremberg in 1531. You will learn how to make iron gall inks of several varieties, carbon ink, a number of colored inks (including white), invisible ink and an ink eradicator. The author has modified the type slightly to better fit modern orthographic conventions, and thankfully, also includes a glossary of the more obscure terms; this occupies Chapter 3. Chapter 4 and 5, though brief (both take just two pages), include recipes for both Jewish and Persian inks, which are considerably more complex than many of the more standard inks. Chapter 5 is a fascinating overview of Oriental ink sticks by Claes G. Lindblad, a Swedish, self-described “Western scribe.” The chapter subtitles say it all: “AN ORIENTAL TREASURE FOR WESTERN SCRIBES, With short detours into the areas of Liquid Oriental inks and Chinese Painting Colours”. This lengthy essay occupies a third of the book, and it’s personal, somewhat meandering style parallels that of the author (or, in this case, editor). It provides the reader with a lot of information about Oriental stick inks, some of their working characteristics, their classifications, and a lot of lore. Just as, reading Thompson’s first chapter, I couldn’t wait to start making a batch of my own ink, I can’t wait to get to my local Oriental store and pick up some nice ink sticks. The author of Manuscript Inks is also general editor of the entire Cabor Press, in which Mr. Thompson makes available a number of ancient or simply long out-of-print papers he finds interesting and useful, and that he feels would be of interest and use to others of like minds. These deal with such topics as leather, gilding, watermarks, papermaking (including a selection of hard-to-find short pieces by Darth Hunter, aptly titled The Darth Hunter Reader), wine and beer recipes, and of course quite a bit about bookbinding. He also markets a series of videotapes, mostly about bookbinding and book repair. It’s well worth a visit to his website to get a few of his very reasonably priced books (including the subject of this review), as well as a good bunch of ink-making supplies. This book review was cited by Ante Bath Notes, referencing a calligraphy course where inks were made from the formulas in this book: "...ink from Jack C. Thompson, made with Catalan ilex galls we sent him. A paler, almost golden colour..."